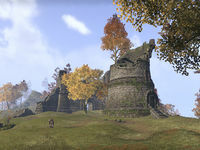 Coldcorn Ruin is a ruined fort in central Cyrodiil, north of Fort Ash. The ruin is overrun with trolls. Coldcorn Ruin is seen in Oblivion as Fort Coldcorn.